Undergraduate Student Government (USG) Senator Andrew Machkasov wants to overturn the Senate’s Feb. 14 confirmation of USG Chief Justice Aravinth Pushparaj. On Wednesday, April 3, the judiciary heard Machkasov’s case against USG President Justas Klimavicius, USG Executive Vice President Abdelrahman Salama and Pushparaj. Pushparaj was confirmed over a year after he initially took office and the vote was added to the agenda less than 24 hours before the meeting. The USG Code requires business to be added to the agenda at least 48 hours before taking a vote. The USG constitution requires the chief justice to be confirmed within the academic year he was appointed. Machkasov argued during the trial that, by breaking these rules, the executive branch abused its power. “I filed the case, because I feel that due to overstep by the executive and lack of following the proper procedure, the vote was not held in accordance with the constitution and code of the USG,” Machkasov said. Pushparaj recused himself from the proceedings. He argued during his defense that the four associate justices sitting on the case faced a conflict of interest. 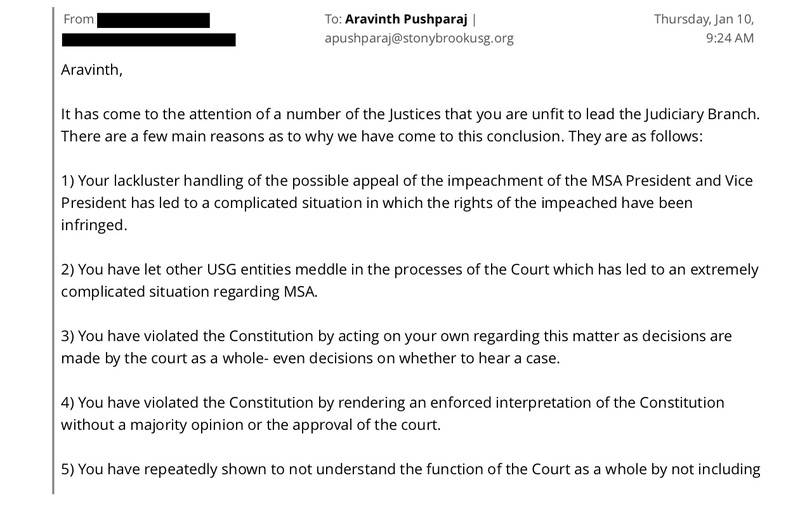 Earlier this year, three justices sent an email to Pushparaj, expressing concerns over whether he was fit to hold office. The email called for his resignation and pointed out that Pushparaj had not been confirmed. 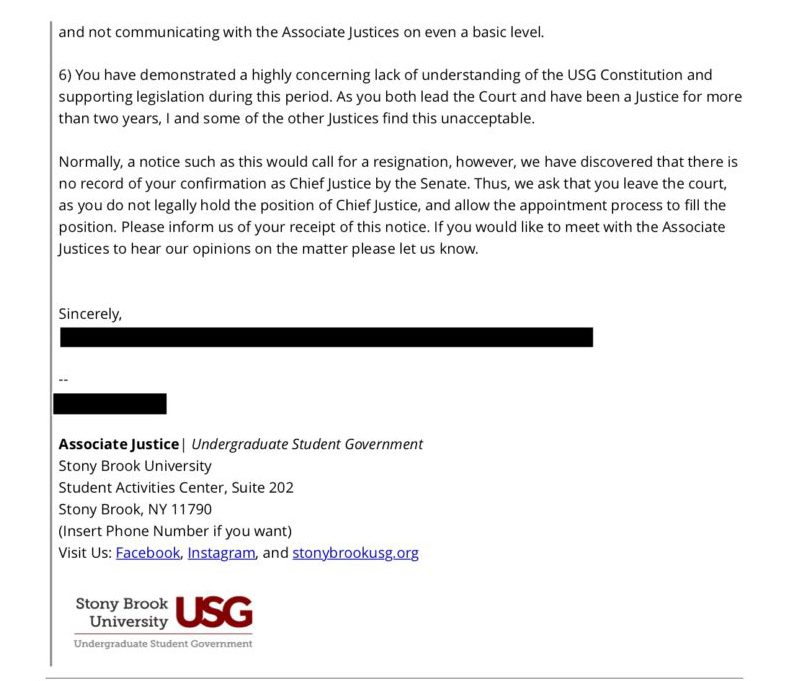 An email from USG members asking Aravinth Pushparaj to step down as Chief Justice. Their names have been redacted in fear of retribution. The email was a point of contention throughout the case. Salama argued that the email showed the justices’ bias against Pushparaj and constituted a conflict of interest. The justices pushed back against this notion, pointing out that judicial bylaws do not specifically define what counts as a “conflict of interest.” Associate Justice Imad Chaudhry also pointed out that since the case was only discussing procedure and not Pushparaj’s appointment itself, the email was irrelevant. Klimavicius said that he didn’t know Pushparaj wasn’t confirmed until it was brought to his attention earlier this semester. Klimavicius claims he sent an email when he found out, informing senators of the mistake and asking them to resolve the issue with a vote during its meeting the next day. Machkasov also voiced concerns that Pushparaj’s appointment was never heard by the Senate’s Vetting and Legislative Review Committee. Machkasov himself came to the confirmation hearing with 16 questions prepared. He said Salama only allowed him to ask four. Klimavicius pointed out that during the confirmation hearing, the Senate voted down Machkasov’s request to ask more questions. Salama argued that there have been confirmations in the past that didn’t go through the ad-hoc committee andthat it is within the president’s power to make confirmations without one. “Constitutionally speaking, it is up to the president to have executive power and it is also, constitutionally speaking, up to the executive vice president to determine the procedures of how the meeting was run,” he said. He also argued that overturning the Senate’s decision would invalidate its opinion. The Judiciary Committee said that it would come back with a decision next week. A previous version of this article mistakenly listed USG’s administrative director, Rayna Simon, as one of the defendants. Simon was originally listed as a defendant in court documents but her name was later removed by the judiciary.